after the huge feedback of my iPad drawing the last days, I have now worked on a workaround how you can use my products on your iPad pro. First let me say. I work only with apple products, I cant give you any advice for PC users or if you use anything else than an iPad pro. Here is a list of Apps and Tools I have and use for this Tutorial. First of all what is important to know that files you can purchase in my shops are all optimized for print and canvases sized 12×12“. Working on an IPad is bit different compared to work on a computer or laptop. Thats why I decided for me to resize all my products I want to use on my ipad to a size of 1500x1500px (Hight/width depends on the size of the original file). Sure you can take your NBK-Design Folders into your dropbox or your iCloud drive but you will see that you come fast on your limits or better said on the limits of the space on your ipad, dropbox and icloud drive. You should always first think about what you like to create on your iPad. Do you want to create something for print in 12×12“ or bigger, then you should leave the file sizes how they are and drop the tutorials how to resize them. Do you want to create a card or a letter size canvas, go and size down the files to a smaller version (How to do that read further). I am gonna show you now how to prepare your files that they are smaller to use on your ipad. create somewhere a folder on your computer. 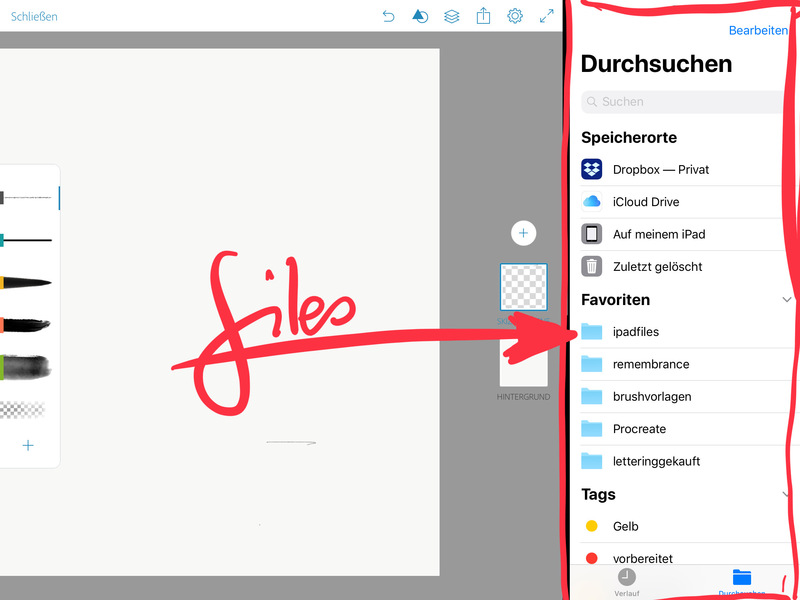 or you can now start to resize the files before your move them to the dropbox/iCloud drive. follow that steps on each of the files you have in the folder. when you are done, move that folder (unzipped) into your dropbox or your iCloud drive. NOW we can pick our ipad and start to play. You will see a preview of already created files (like its here to see at my ipad) or an empty space. 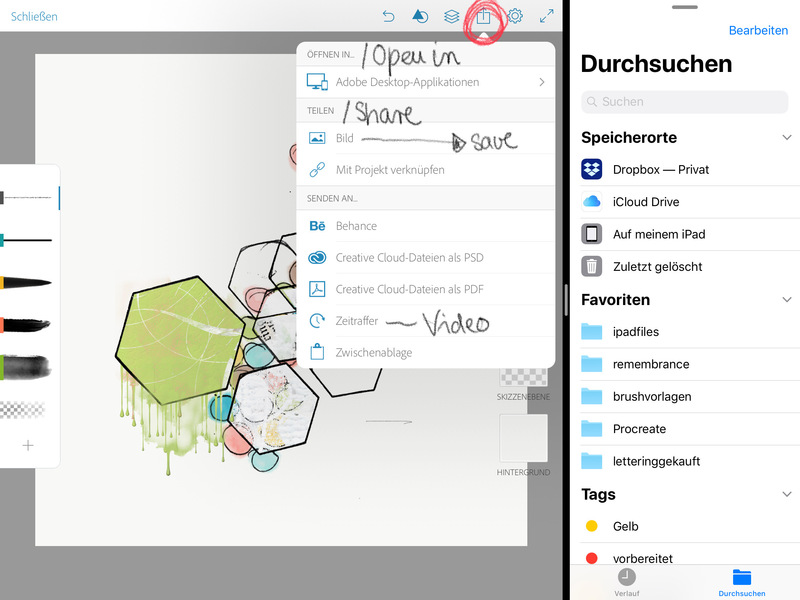 This is how your ipad with Adobe sketch now looks. In this post I only talk and show you have to use Files created by NBK-Design on your ipad. Loading Brushes will come up in a later posting. Next step is HOW to open now all the files you have in your dropbox / icloud files, for that you need to use the new iOS with split screen. if you have your files on your icloud drive you should see the folder for sure. if you now see the actual files (pngs and jpgs) you can finally start to play. 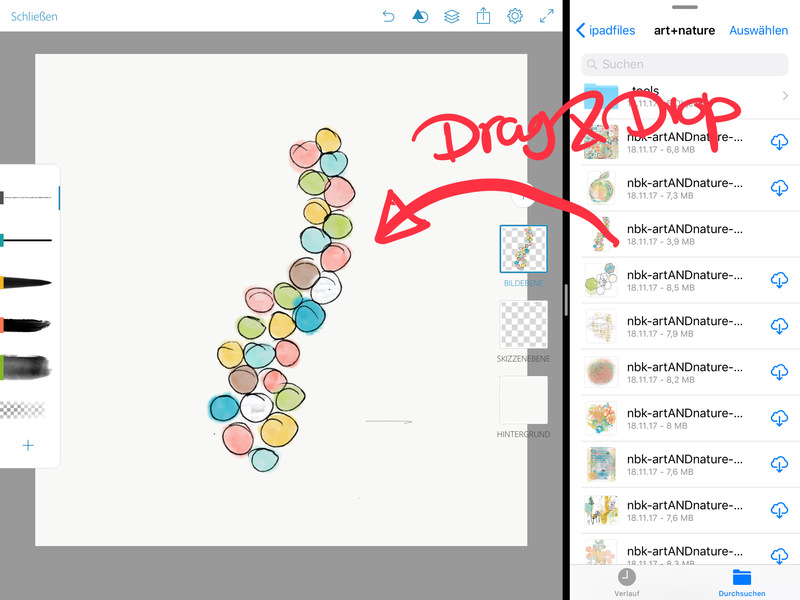 tap on a file, until it hoovers and then drag it on your your canvas, release it and it will need a few seconds and you have the file on your canvas, placed as a own layer. 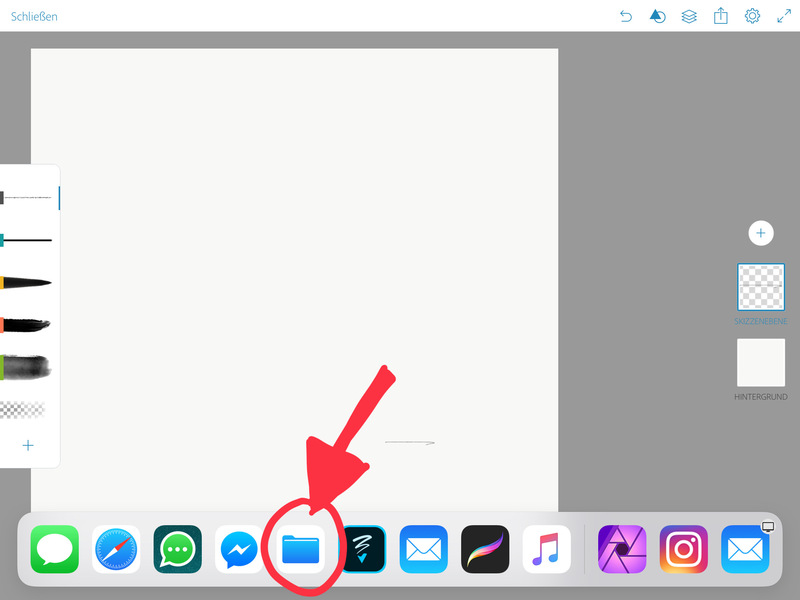 Its still selected and you can move it around on your canvas to finally place it, tap on Ok on the blue line on top of your ipad. The screen now shows the layers and the cavas with your already placed elements. If you want to move your layers tap on the layer icon and wait till it hoovers and then move it up or down. If you want to resize it, tap on the layer and a window will open and you can chose there transformation. Also you can find there some blending mods or you can delete from there the layer. Double tap on the layer will hide the layer, double tap again it will show the layer again. if you are satisfied with your new created art journal page, scrapbook page or painting, you can save it by taping the icon i have marked in red. Now you have some different ways to share or work on the file further. IF you have your photoshopCC open on your computer/laptop, go to Adobe Desktop Application and chose Photoshop and the ipad file will open on your Computer/Laptop as a layered psd file. You have now the freedom to work on that file further or save it on your hard drive. OR if you are happy with your file on your ipad you go to image and save it or share it wherever you like. 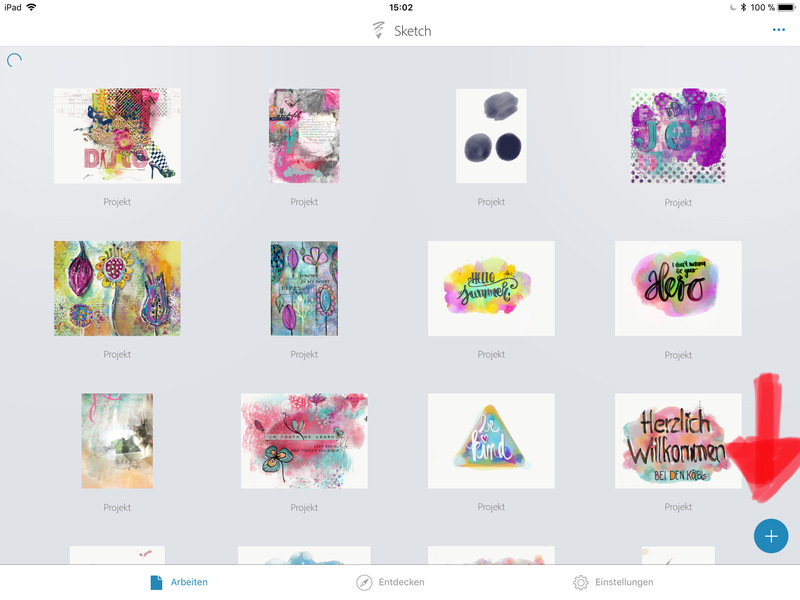 Now you can share your art work with friends or on your social media channels.